An application has been submitted to Ministry of Forests, Lands and Natural Resource Operations (MFLNRO) for use of a small parcel of land on Heriot Ridge for a communications tower. There are several concerns about this, including concerns about mistakes in the application and the procedure, in addition to concerns about the usage and the site chosen. There is some confusion about this, so it’s best to go through this in order of history. 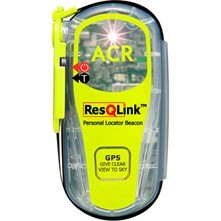 It is an a ResQLink PLB-375 (part number 2880), made by ACR. Its one of those things that we hope to never have to use. Its sole purpose is to call for help from Search and Rescue by sending your GPS position to a satellite system when activated. It’s small and light and easy to use. Unclip the antenna so that it is vertical and push the ON button. WARNING: This PLB is authorized for use only during situations of grave and imminent danger. It is only to be activated when all other means of self-rescue have been exhausted. Deliberate misuse may incur a severe penalty. In other words, try your cell phone and/or VHF radio first if at all possible. There were several options that the club considered. All use a satellite system for communication; some have additional, very desirable features and higher costs. These beacons must be registered with the government, but there is no monthly or annual usage charge. It uses a 5 Watt 406 MHz signal to send the distress signal to the satellites. ACR makes several models and there is also the McMurdo FastFind 220. SPOT2, SPOT3, and Delorme inReach. In addition to the SOS feature, these units also can send “I’m okay” messages to selected contacts, they can send periodic position reports so that your friends can follow your track on a map on a web page, and they can also send “send help” messages to your selected contacts instead of to search and rescue. These are desirable features, but they come at a cost of at least $100 per year, which is more than the club can afford. Both Spot and inReach use the commercial satellite phone systems. Spot uses the Globalstar satellites and inReach uses the Iridium satellites; both systems use low earth orbit satellites. The satellite system can do two-way communication, but these devices can only send pre-written messages; they cannot receive messages. SPOT Connect and inReach Smartphone. These devices can do all of the above, plus they can be used together with an app on your smartphone. You can write a short text message on the spot and you can receive messages. This is a very nice feature, and it comes at an additional expense. The inReach SE is similar, except that it is stand-alone; it does not require a smartphone. Two way communication will obviously dominate in the future. If you ask for help, it’s nice to say what kind of help you need. It’s nice to have confirmation that help is on the way. From the SAR’s point of view, it’s nice to know that it is not a false alarm. Satellite Phones. These have been expensive to buy and expensive to use. SPOT makes one now which is more affordable. Relatively speaking. Contact Info 285-2999. Please contact the trip coordinator prior to the trip. Description We will hike to the summit viewpoint with a side trip to Nugedzi Lake on the way down. The group hiked the longer loop, on a warm, sunny, windy afternoon. This is a beautiful forest and coastal walk. This two-day trip morphed into a three-day trip in order to avoid the worst of the ferry traffic for the Cortes Music Fest. All three days were hot and sunny with strong northwest wind at night and mostly light and variable during the day. As a bonus, we didn’t get caught in any of the ferry overloads! Date 24 July 2013, Rescheduled from 17 July. Description Calling all QI Outdoor club members and guests to a Potluck Picnic Dinner at Rebecca Spit on Wednesday, July 24 starting at 5:00 p.m. We’ll have a few kayaks on site, so if you’ve been wanting to try your hand at paddling, this is your chance! Dinner starts at 6:00. We’ll also have some short reports on club excursions to date and time to discuss your ideas and feedback on Club activities and plans. AND – there will be a draw for a door prize, so be sure to bring family and friends! Notes: If a postponement is needed, it will be posted here as a comment. Four intrepid hikers went for this challenging hike on a clear, warm day. We hiked up to the Seymour summit with excellent views of Little Nugedzi Lake, the outer islands, coastal mainland and Vancouver Island. The trail was in excellent condition after being cleared from winter damage by volunteers for the Trails Committee. We continued on to Nugedzi Lake for lunch. There was an amazing display of wild tiger lilies around the lakes. The hike then followed the Nugedzi trail through the forest and past the beaver ponds, with a side trip to the viewpoint over Georgia Basin. There has been significant wind damage in this forest over the past winter. From this point the route followed an unmaintained track along the ridge to Beech’s Mountain. Progress was very slow, as the wind damage was severe in this area also. After bush whacking and climbing through fallen trees, the group reached the Beech’s Mountain with rewarding views to the east. The wild flowers were still very good along the way. On the descent to the Chinese Mountain parking lot we encountered a grouse with chicks. It took us 7 1/2 hours to go the 12.2 km, with lots of breaks and stops for photos.